This image by Chris Jordan is from a project documenting the impact of environmental plastic on the baby Albatross of Midway Atoll, that are mistakenly fed this lethal meal by their parents. Water plus art in Sydney. However the problem is not confined to our oceans. In Australia we dispose of an estimated 4 billion plastic bags, which could be recycled. Even reusing your plastic bags as bin liners means they end up in landfill. At the moment only 3% of bags are currently recycled. Recently there have been calls for a deposit scheme for plastic drink containers, similar to the system operating in South Australia. This is being fought by major beverage companies. One of their arguments is the added cost to the consumer, which is a paltry argument given the cost to the consumer in terms of the environmental damage caused by plastic. Federal Environment Minister Tony Burke says he will consult with the states to bring in a national bottle deposit scheme. He says further discussions with state ministers will take place over the next couple of months. Carry your own reusable bag. Compliment businesses when they use paper bags. Refuse plastic bags when shopping and ask if the business would consider paper. Use the new garbage collection effectively and wrap scraps in newspaper, then ditch the plastic bin liners. Perhaps you can use the small plastic compost bin in your freezer, then you just put some paper on the bottom so the frozen scraps fall out easily into the green bin on collection days! Petition Council to introduce more filtered water ‘bubblers’. 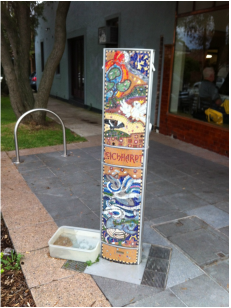 Lismore Council has set a good example in reducing the number of discarded plastic bottles by providing street bubblers and Leichhardt Council has turned them into art. Contact your State and Federal representatives and ask them to support the drink container deposit scheme. Check out some of the links on the impact of plastic in the environment.